Hikaru Utada's "Face My Fears" EP out now worldwide! Hikaru Utada's "Face My Fears" EP has officially released worldwide ahead of the launch of the highly-anticipated Kingdom Hearts III. Purchase the album for $3.99 and receive the opening theme songs "Face My Fears (English Version)" and "Face My Fears (Japanese Version)", and the closing theme songs "Don't Think Twice" and "Chikai". "Face My Fears", the opening theme song to KH3, is performed by internationally renowned singer-songwriter Hikaru Utada and eight-time Grammy Award-winning Skrillex. Below we have shared a few select regions where you can purchase the album on iTunes and Google Play, along with streaming links for Apple Music and Spotify. Re: Hikaru Utada's "Face My Fears" EP out now worldwide! 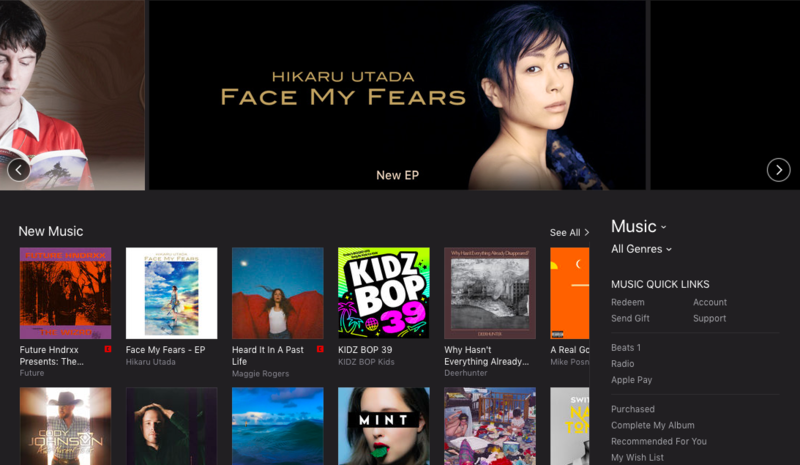 I just want to note that this is the first time Utada has gotten a banner on iTunes US, so this is such a great honor. That's awesome. I wish she could somehow become a big pop girl in the US too. Already got the songs last night. Preordered ages ago and they sent an email and an iTunes alert to tell me the song is out. I'm lovin' it! Itâ€™s already #2 on the iTunes album chart and #13 on the songs chart!! Haven't listened to it yet personally, but I have a question for anyone that's more knowledgeable on the subject? I read a press release today that a vinyl edition is going to be available Spring 2019. I totally plan to get it. I already see preorders on Play Asian and other import sites... but not on English sites. The option is technically available on Amazon, but there's no information about it or anything. Does anyone know if it's 100% going to be released outside of Japan? Should I preorder it on Play Asia or cdJapan or something just in case? I love the song, although it feels like there isn't any climax. Also "Hatsukoi" her latest studio album is also now avaliable on Spotify and Apple Music. Now Official Making her entire Discography avaliable on Streaming Music Services. Still missing her English albums though. After hearing the full version I no longer dislike it. Still not the biggest fan of the obvious Skrillex section, but it's not bad like it was for me in the short opening trailer. It kind of fits, now. Maybe it's a case of how I felt with "Don't think twice". At first it was boring, but now I like it. It'd be great to see it available in brick and mortar record shops. (I always scan look to see if she's somehow been imported when I go to mine, but she's never there.) I'm probably just going to order it on an import sites though. I've held out too long on Hatsukoi already, and it has a vinyl release too. I went ahead and purchased this EP digitally though, because I'm much too impatient, and I have no regrets. These are solid tracks. I'm glad any doubts about the collaboration were hushed.